These vegetarian Sausage Breakfast Tacos are full of fresh colorful flavor. In a nonstick pan melt 1 tablespoon butter over medium-low heat. In a small bowl beat the 4 eggs & 1 tablespoon heavy cream until combined (no streaks of the yoke). In a separate pan, cook the 4 MorningStar Farms® Sausage Pattys & 4 MorningStar Farms® Bacon Strips according to their packaging instructions. Let cool & cut the Sausage Pattys in half & chop up the Bacon Strips. 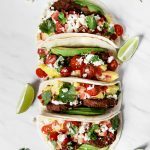 Fill each soft tacos with avocado, egg, a Sausage Patty, tomatoes, sour cream, queso fresco, cilantro, Bacon Strips, & a squeeze of lime.